Socialist Action (CWI in Hong Kong) comments: Not many governments can match the record of Hong Kong leader Leung Chun-ying (“CY”) for pushing so many angry people to join street protests in so short a time. In the eleven weeks since CY came to power we have seen 400,000 marching against him on his first day in office, July 1, followed by 90,000 marching on July 29 against his patriotic education curriculum, followed when the school term began with a nine-day siege of the government complex at Tamar, with protest numbers swelling to 120,000. Polls show 77 percent are opposed to the new education policy, which is nationalistic and glorifies the role of China’s allegedly ‘communist’ dictatorship. Suddenly, without any democratic discussion, the mostly middle-class leaders of the Tamar protest movement announced through the media that they were calling off the mass protests. This u-turn was announced on the eve of the four-yearly elections to the legislature, on Sunday September 9, after CY announced a partial retreat in waiving the three-year deadline for introducing the new curriculum as a compulsory school subject. The school student campaign initiated by CWI comrades, called School Strike Against Brainwashing, which was an active and growing force in the mass Tamar protests, commented in a press release that “a historic movement has been cut short prematurely, before achieving its main aims. The government of Leung Chun-ying is in deep crisis and could have been pressed into much bigger concessions.” (The full statement is carried below). The decision to dissolve the mass protests, while causing some confusion about the extent of the CY’s concessions and how to respond, has not dissipated the anti-brainwashing movement or the anger of the youth, schoolteachers and others involved. 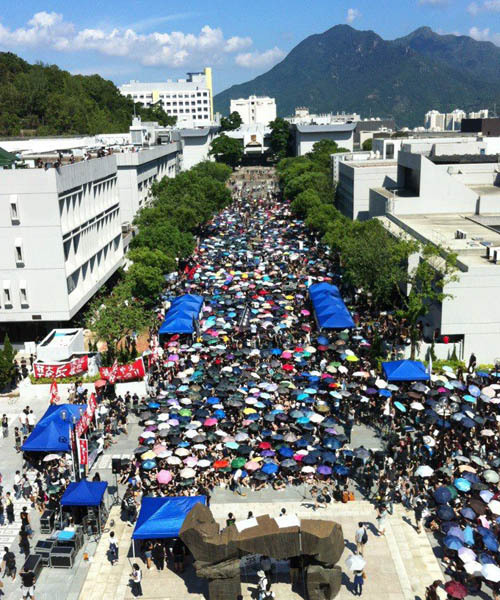 On September 11, a half-day strike in the university sector met with a huge response, with 8,000 students attending a protest rally, the biggest such action in Hong Kong since the 1989 Tiananmen Square movement. The first article below is an eyewitness account of last week’s mass mobilisations written by a visiting CWI comrade. 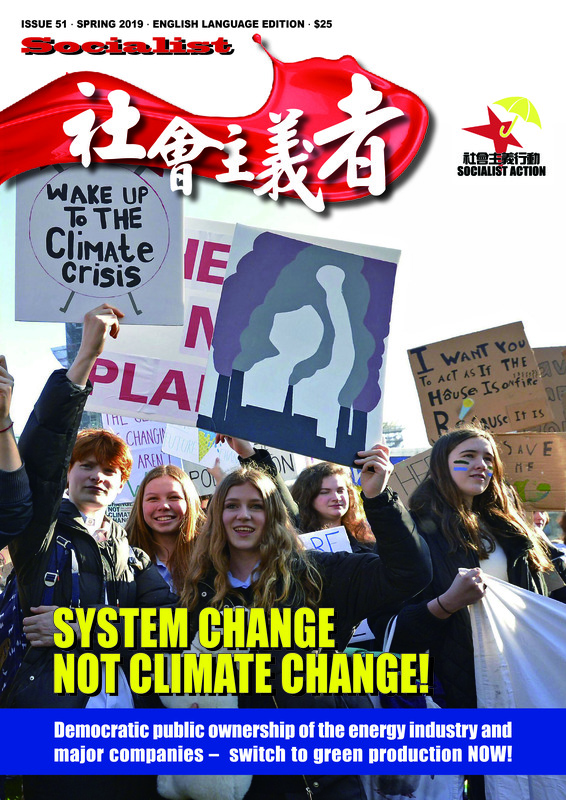 The second article is the statement by CWI member Sally Tang Mei-ching on behalf of the School Strike Against Brainwashing campaign criticising the decision to end the Tamar mass protests. Over the past week, the ‘Occupy Tamar’ movement developed in Hong Kong and quickly posed the biggest challenge yet to pro-Beijing ‘strongman’ CY Leung. It was part of the broader opposition to the implementation of the so-called ‘national education plan’ a series of nationalistic lessons glorifying the CCP (Chinese Communist Party) to be taught in all Hong Kong schools. In the face of a permanent occupation and daily mass protests, CY’s government was forced to make a partial retreat on Saturday (September 8) evening. It was announced that the three-year period in which schools were required to implement the plan would no longer be enforced. 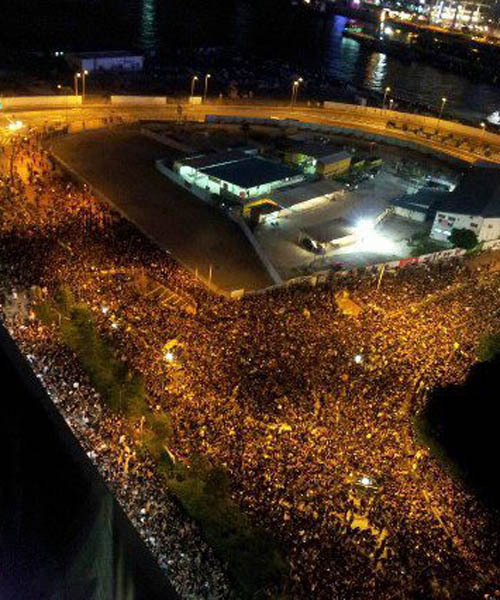 Over 100,000 rallied in Tamar Park that night, excited over what the movement had already accomplished and convinced that it could achieve much more. But in the early hours of Sunday morning, the leadership of the movement abruptly announced that the occupation was to end. 24 hours later, Tamar Park stood empty. Banners that had been hoisted in victory the night before could be seen sticking out of dumpsters. How did this happen? The pro-CCP national education plan was originally put forward by the previous administration. New chief executive, CY Leung, announced he would stick with the policy despite vocal protests. This provoked an immediate upsurge of anger and street protests (read more:http://www.socialistworld.net/doc/5874) with a 90,000-strong demo on July 29, where Socialist Action (CWI) intervened with the call for citywide strike of secondary schools to force the government to back down. In the following weeks, Socialist Action helped initiate the School Strike Against Brainwashing campaign involving high school and university students, and other community supporters. Every week, the campaign set up street stalls with petitions calling for a school strike. The response was good and thousands of signatures were collected. On August 13 the campaign organised a lobby of 60 demonstrators at the office of the Professional Teachers’ Union (PTU), to which 80 percent of Hong Kong teachers belong. The PTU leaders, who are closely tied to the ‘moderate’ Democratic Party and are a key constituent of the Civil Alliance Against National Education, which organised the Tamar protests, have been dragging their feet on the issue of a strike. The situation began changing on September 1, when a demonstration was called by the Alliance outside the Legislative Council (Legco) building. Over 40,000 demonstrated in torrential rain, and stayed outside past 10 o’clock in the evening. 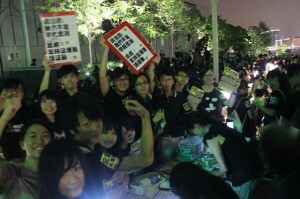 The School Strike Against Brainwashing campaign passed out thousands of leaflets and got a good response to our slogans. The growing radicalisation of the movement pushed the leaders of the Legco protest, the Alliance, to call for another demo on Monday September 3. This was the first day of classes for most high school students and the turnout was over 10,000. Some people brought tents, partly to shield themselves from the rain. This protest and occupation took on the name Occupy Tamar, named after the district around the Legco complex. Demonstrations continued daily, and the movement quickly picked up momentum. The Federation of Students put out a call for a strike of university students to take place the following week on September 11. Art students from one campus created a replica of the Goddess of Liberty, a symbol of the Tiananmen Square movement of 1989. Our comrades and School Strike Against Brainwashing activists passed out thousands of leaflets every night, over 30,000 by the end of the week. By Friday, over 120,000 people had gathered at Tamar and there seemed to be no limit to the movement’s growth and what it could accomplish. But all was not well within the movement. After the Monday demo, the School Strike Against Brainwashing campaign began having problems with the main organisers of the demos. 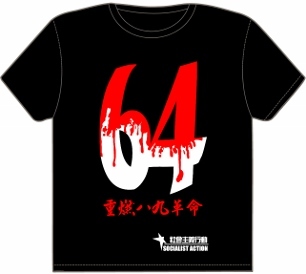 This included the group Scholarism, a school student campaign group, which is widely seen as the movement’s driving force. 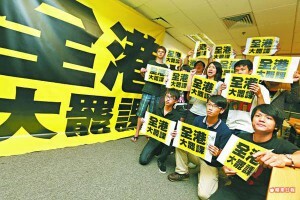 While saying they are not against the idea of a school strike, Scholarism has not supported calls for a strike, instead advocating other more vague forms of ‘civil disobedience’. At Tamar, Scholarism activists tried to put pressure on the School Strike Against Brainwashing campaign to stop running stalls and campaigning for a strike. Some claimed School Strike Against Brainwashing was trying to masquerade as Scholarism to get support and signatures on its petitions. So our comrades produced placards saying ‘We are not Scholarism – We are the School Strike Against Brainwashing’. Giving up the right to hold stalls was not an option as far as we were concerned. Scholarism has a membership of around 400 but has a huge facebook following of over 160,000 ‘likes’. While as a fresh force, with a 15-year old spokesman, it is widely supported as a symbol of the fightback against CY’s government, it doesn’t seem to have any kind of democratic structures to allow school students to shape its strategy and demands. Likewise there wasn’t any democracy in the way the Alliance organised the demos, which became increasingly non-political with artists and bands playing, in contrast to mood of the demonstrators which was becoming more political. The School Strike Against Brainwashing campaign had asked to become part of the Alliance and to work with the other groups to organise demos, but these calls fell on deaf ears. When it was brought up with members of Scholarism, the response was “I don’t know what the process is for becoming part of the Alliance.” So effectively the leadership and all proposals came from an unelected group with close ties to the PTU leadership and some NGOs, from which they got the technical infrastructure for the demonstrations (sound equipment, first aid tents, as well as funding). By midweek, the School Strike campaign was being confronted at our stall at Tamar and attacked on facebook and in the newspapers. 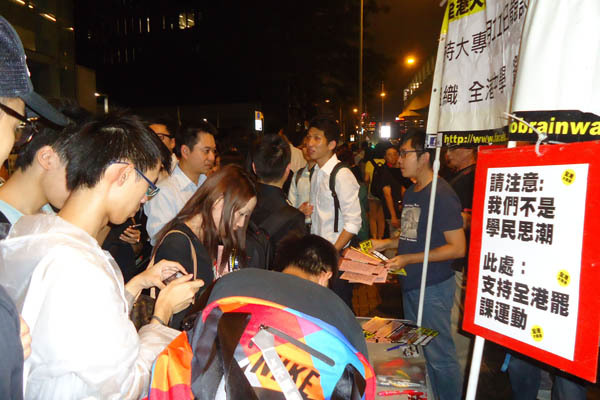 It was claimed we were pretending to be Scholarism and attempting to “hijack” the movement. Our campaign was also criticised for collecting donations and email addresses on our petitions. These attacks started raining down because School Strike Against Brainwashing was getting more and more effective in raising its demands, which did not suit those who wanted to prevent this movement becoming too radical. The comrades produced a leaflet replying to these unfounded criticisms and also posted a reply on facebook that so far has over 200 “likes”. It was necessary to defend our own right to campaign for a strike but also explain the need for free speech and democratic discussion for all those involved in fighting the government. The attacks reached a high point on Wednesday when a female supporter of People Power, a political party not affiliated with Scholarism, incited a group of demonstrators to attack the School Strike Against Brainwashing campaign stall, knocking material over and prompting the police to intervene. Despite these internal contradictions, Occupy Tamar went into the weekend with a full head of steam. School Strike Against Brainwashing held its largest organising meeting ever, on September 8, followed by a press conference covered by most TV and newspapers. Near the end of the meeting, which decided to call on the leading groups to organise a strike of secondary students in late September, the announcement came: CY had flinched. But it was only a partial retreat; the national education policy could still be implemented by schools on a ‘voluntary’ basis. This means the schools controlled by pro-CCP forces will push ahead and can then exert pressure on other schools to follow suit. As we went to Occupy Tamar that night, the crowd was pulsing with a sense of empowerment and joy. Over 100,000 people were united in celebration. Thousands of leaflets and stickers calling for a school strike were distributed, and it looked like the university strike on September 11 would be much bigger than originally anticipated. The possibility that this movement could grow to not just defeat the brainwashing plan, but to also take down CY’s government was hanging in the air. After the rally, most people went home and the occupiers started settling in for the night. Then suddenly, at around 2 o’clock in the morning, an announcement was made that the Tamar mass protests were to end. All tents should be removed the following day, Sunday. Returning on Sunday evening, Tamar Park was empty. A few families were strolling through with their children. But there were few signs of the massive protest from the nights before. A group of 30 to 40 people were attempting to maintain the occupation. One young teacher said that he had no idea how the decision to call off the occupation was made. He said that it was wrong to call off the occupation, that it was necessary to keep fighting against the national education plan. It seems that the leaders of the Tamar protests, who are not under the democratic control of mass organisations, became uneasy over the radicalisation of the protests and the scale of the movement they had unleashed. They readily admitted they were “not satisfied” with the concessions from CY, but still cancelled the protests without proposing any alternative method to continue the struggle. It is becoming more and more clear that the leaders of this Alliance are dead set against calling a strike and were afraid the daily protest rallies were becoming a springboard for the strike movement, with the CWI comrades and School Strike Against Brainwashing as the most articulate campaigners for this action. Fortunately, the movement has not been dissipated. The university students’ half-day strike on September 11 was the biggest action of its type for more than 20 years. CY’s relief over the demobilisation of the Tamar protests proved to be short-lived. The struggle continues and can reach a higher gear, with a citywide school strike being a real possibility, in the coming weeks. At 1.30am on September 9 – after most of the 100,000 protesters had gone home (the third largest mobilisation since July 29) – the leaders of the Tamar protest movement decided to call off the protests. School Strike Against Brainwashing disagrees with the timing and method by which this decision was taken – by a ‘small circle’ of leading activists from the Civil Alliance Against National Education. In our opinion, a historic movement has been cut short prematurely, before achieving its main aims. The government of Leung Chun-ying is in deep crisis and could have been pressed into much bigger concessions. The government feared for its very survival. If the mass protests had continued even for one or two more days it is highly likely that the national education policy would have been unconditionally scrapped. Now the movement must be rebuilt, it must regroup to go forward, recognizing that a historic possibility has unfortunately been wasted. The most important now is to understand the vital lessons of this movement. Has the anti-brainwashing movement achieved its aims? Even Alliance spokespeople, in calling off their action, admit that the struggle is not yet won. Leung Chun-ying’s removal of the three-year deadline, while a significant partial retreat, still means the authorities can push ahead with national education on a ‘stealth’ basis, school by school. After demobilising the mass protests, the Alliance say they are concerned that the government is still issuing guidelines for schools to implement the national education curriculum. This shows they acted rashly in calling off the movement before such ‘details’ were resolved. Previously the Alliance constituent organisations (Scholarism, HKPTU, Parents’ Concern Group and Christian groups) vowed to continue the struggle until the national education plan was completely withdrawn. But unfortunately, by abruptly halting ‘this stage’ of the protests (the week-long and still growing mass siege of the Tamar government complex), it will be harder to mobilise in such huge numbers again. The reality is that the powerful forward momentum of the mass struggle has been disrupted – mass movements cannot be turned on and off like a tap! Many activists naturally hope that this will not be the end of the struggle. School Strike Against Brainwashing are not defeatists – we will continue and step up our campaign activities. But we also have to face the truth: that the shock decision to dissolve the mass protests, its timing and the manner in which it was done, have shifted the struggle from last week’s extremely favourable forward march to a situation that is more complicated. What type of movement was Tamar – why was it cancelled early? The Tamar protests were not only about national education even if this issue was the spark. The daily mobilisation of huge crowds resembled the Arab Spring and other mass struggles such as the US ‘Occupy’ movement. The movement vastly exceeded the expectations of the Alliance leaders. It began to overstep its original aims and become a more generalized anti-government struggle against CY’s undemocratic regime and the Chinese dictatorship. 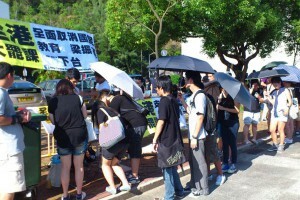 Thunderous chants of “Down with CY” showed the radicalized mood of the participants. The leaders of the Alliance wanted to limit the struggle only to the issue of national education and prevent it becoming “too political”. As the week progressed the itinerary of the mass protests was depoliticized, with music and artistic performances taking up more and more time. When the Goddess of Democracy statue was brought by some university students to Tamar, it was sent away by the Alliance, who seemed anxious to avoid the obvious comparisons to the mass youth movement of 1989. The Alliance leadership became nervous that the movement was getting out of their control and acquiring very radical features. School Strike Against Brainwashing activists were harassed by Alliance stewards for giving out leaflets and stickers calling for a strike. We defended our right to participate and campaign and we got support from other demonstrators, many thousands of whom signed our petitions for a strike. School Strike Against Brainwashing do not only speak up for our right to campaign in this way – to collect signatures and donations and spread leaflets – this should be the democratic right of all organisations that are active in the anti-brainwashing struggle, or any other mass struggle. A mass movement cannot be monopolised by just one viewpoint (this is precisely what we oppose in mainland China) – it must be democratic and inclusive, with all groups having the right to express their views on building the struggle. The attempt by the Alliance to impose top-down control of the movement and to avoid ‘politics’ and ‘too radical’ methods, were surely important factors behind their decision to cancel the mass protests so suddenly. How should decisions be taken? On September 9, in the early hours following a 100,000-strong demonstration, representatives of the Alliance announced the end of daily mass protests. We and all other groups and individuals involved in mobilising for this struggle have a legitimate right to ask how this decision was arrived at – and why it was not referred to any broader forum for discussion and debate? No mass struggle involving hundreds of thousands of people is the ‘property’ of any specific grouping, regardless of how hard its activists may have laboured to build the movement. A democratic leadership has a responsibility to insure all major decisions – especially the decision to call off a massive protest movement – are discussed and understood by the mass of the participants. This was not the case with the decision of September 9. Thousands of youth were still at the Tamar complex when the decision was announced and significant numbers began to chant slogans that they wanted to continue the mass ‘siege’, but their appeals were ignored. As far as we can see, most members of Scholarism were not consulted about the decision to call off the protests. The leaders of the Alliance acted in the manner of a ‘small circle’ giving themselves the sole right, through the mass media, to call off the movement. If the Tamar camp participants were ‘tired’, as has been claimed in the media, then there was no shortage of new volunteers among the crowds. With democratic structures and involvement, it is easier to draw greater numbers into the daily running of any struggle. But without democratic involvement in decision-making then any leading group, no matter how hard working or sincere, can misjudge the mood of the masses, make tactical mistakes or be unduly influenced by threats and bullying tactics from the government side. Democracy in a mass struggle, through elected committees at every level, is not an optional ‘luxury’ – it is vital to the success of the movement! Won’t the anti-brainwashing struggle continue in a new form? We must all work energetically to insure that the movement continues until a full victory is achieved. But we must also learn from what has just happened. We must be realistic and recognize that the decision to call off the mass protests in this sudden and high-handed manner makes the next stage of the struggle more difficult than would otherwise have been the case. The Federation of Students’ call for class boycotts on September 11 would of course have been more effective if the daily Tamar assemblies had continued. There is no contradiction in staging several different forms of action – including strike action – alongside an occupation and daily mass mobilisations. Who says that a mass movement can only do one thing at a time? If democratic committees and organisations are built in all schools and local areas, instead of leaving all decision making to a relatively small group of ‘leaders’, then the energies of a mass movement and capacities to improvise new actions are limitless. School Strike Against Brainwashing has since July advocated a school strike as the most effective method to win a complete victory in this struggle. A strike poses the issue of power in the workplace, and represents a more direct challenge to the government’s education policy. Our strike proposal has been opposed openly by leaders of the Alliance, as being ‘too radical’, while others – including some members of Scholarism – say that the issue of a strike has “not been discussed yet”. This shows that rather than showing a lead, the organisations that make up the Alliance are behind the curve as far as this struggle is concerned. Other forces, including largely unorganized youth, are coming forward with more radical ideas, while the Alliance is trying to hold the struggle back. The Alliance could have announced the date for a one-day strike during the 100,000-strong Tamar protests. This would have insured overwhelming participation in a strike. The mere announcement of a strike could have forced much greater concessions from CY, who was under massive pressure. Instead the Tamar protest leaders seem to be saying that the masses should go home and wait until they, ‘the leaders’ decide what to do next. This is not the way to build a mass campaign that can achieve victory. One reason offered by Alliance leaders for justifying their u-turn on September 9 is that the ‘core group’ of Tamar occupiers were tired. This is a surprising explanation – the Tamar protests were only in their seventh day! The original Occupy Wall Street movement, which resonated around the world, continued their first intensive occupation phase in New York for over two months and did not leave voluntarily, but were cleared by the police. Can the tiredness of a relatively small group of core activists really be grounds for demobilizing not just them, but also the mass rallies? This sounds like an excuse. Even without the campsite at Tamar, the organisers could have called for the daily mass rallies to continue. The campsite was not essential – the key was the mass mobilisation. In Eastern Europe, when the Stalinist one-party dictatorships were brought down in 1989, there was no ‘occupation’ – only wave after wave of mass demonstrations and also strikes in some countries. If tiredness was sapping the functions of the core group of activists, they should have opened outwards to other organisations and to the wider masses. A major weakness of the Alliance model for mobilising this movement is that they seem to regard the activities of a relatively small group of ‘insiders’ as the main focus, while the masses are merely called upon to support them like ‘film extras’. As far as School Strike Against Brainwashing is concerned it should be precisely the other way around. The mass movement is decisive while the stage shows and other ‘activities’ of the core activists are not. When the mass movement was cancelled it was still rising. The fact cited by some Scholarism supporters that ‘only’ 100,000 turned out on Saturday September 8, compared to 120,000 the night before, is not evidence of a downturn. No mass struggle rises according to an exact mathematical progression, but by periodic peaks and intervals. Especially if the Alliance had called from the stage at Tamar for a one-day school strike, to build on the example of the students’ 911 action, the movement would have continued to grow and to adopt fighting methods. What about the hunger strikers? It is a similarly weak argument from the Alliance to use health concerns for the hunger strikers as a reason for cancelling the mass protests. A decision could have been taken to halt the hunger strike, but continue the mass protests. Nobody would have challenged this, precisely because of the health risks associated with hunger striking as a form of protest. The Tamar hunger strike was anyway only a symbolic one, rotating for a few days at a time. A real hunger strike (fast-to-the-death) is an extreme method of struggle – to be exercised with great caution. Those participating in the mass demonstrations appreciated the sacrifice of the Tamar hunger strikers, but the movement was in no way dependent on this in order to continue. What lessons should we draw? In a mass struggle, hard work, enthusiasm and good intentions are not enough; tactics and an understanding of the dynamics of a mass movement are needed as well as a democratically accountable leadership. In launching School Strike Against Brainwashing we looked at the lessons of the revolutionary mass struggles in Egypt and Tunisia, as well as the mass struggle in China in 1989. There are important lessons in all of these movements. No movement goes forward in a straight line; there are ebbs and flows. In the Egyptian revolution of 2011, the demonstrators in Tahrir Square fell to a few hundreds on some days only to see new high points reaching millions. The same happened in Tiananmen Square in 1989. The masses cannot be ‘professional demonstrators’ – they have families, jobs and schools to go to. They will come to demonstrate especially when they feel the movement has a clear goal – a strategy – and is not just blindly repeating the same thing day after day. The key is a leadership which is accountable through elected committees to the masses, and can propose the necessary tactical steps to escalate the struggle when needed. In Beijing 1989 and Egypt 2011 too, the issue of strikes by workers, including a general strike, were posed. In Beijing this happened too late (the student leaders were opposed to a general strike), when the masses were beginning to tire and the regime was already crushing the movement. In Egypt in February 2011, the strikes spreading through the factories were the decisive ingredient that toppled the dictator Mubarak. We must learn from these important struggles, their mistakes and strengths, in order to build a successful mass movement to defeat not just national education but also CY’s undemocratic government.